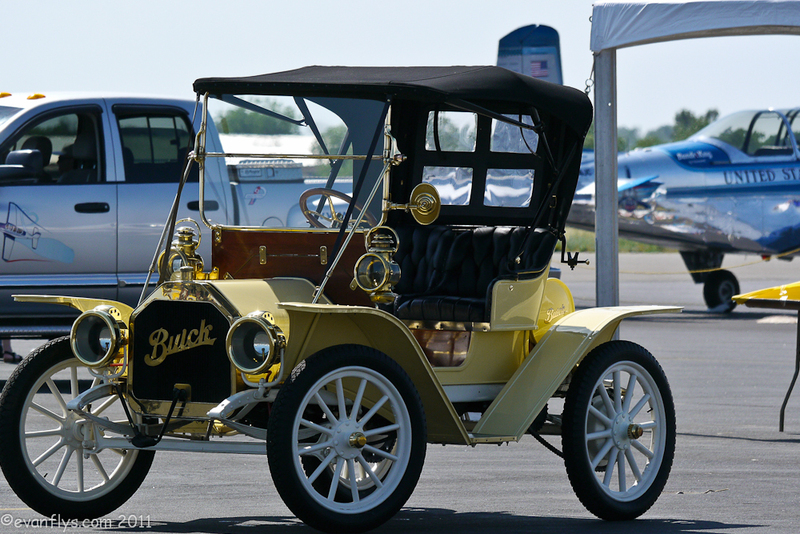 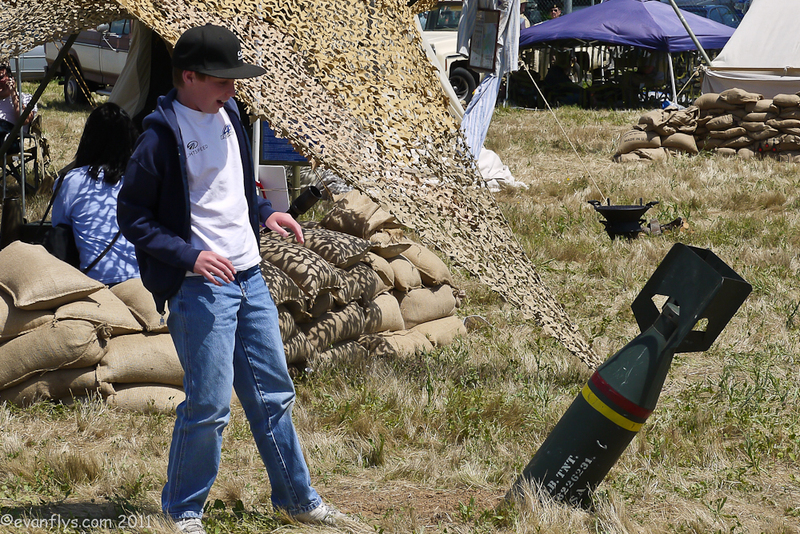 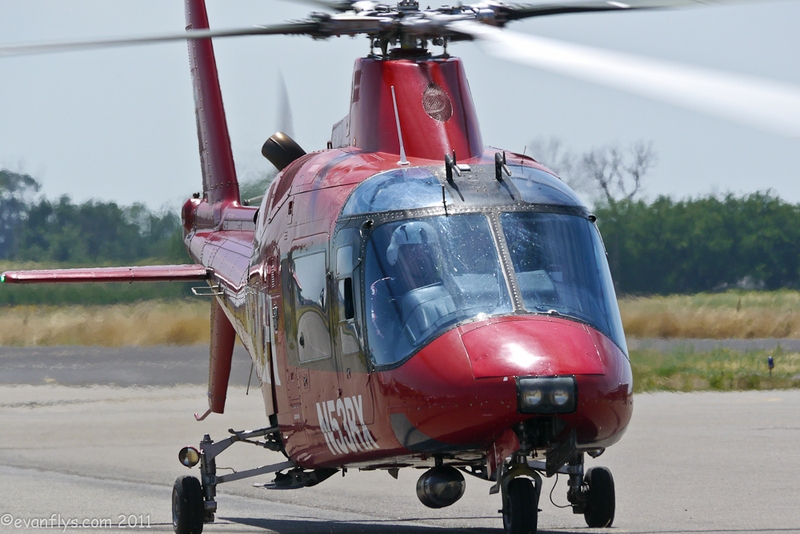 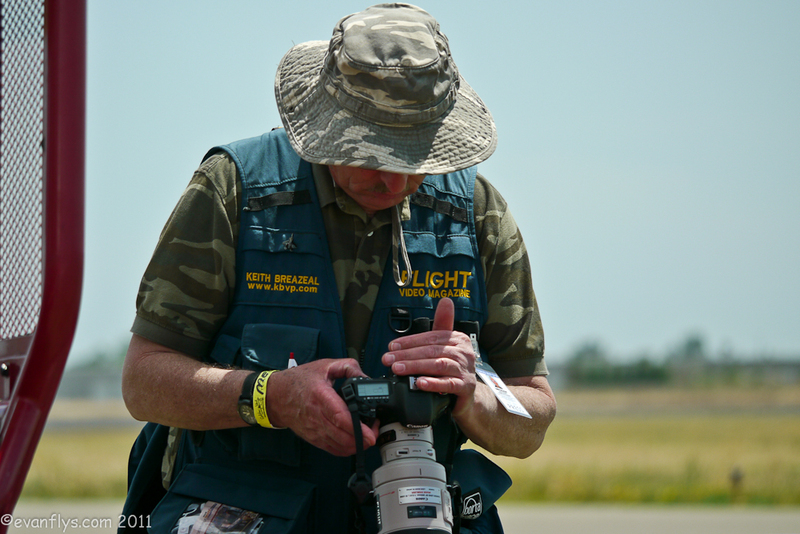 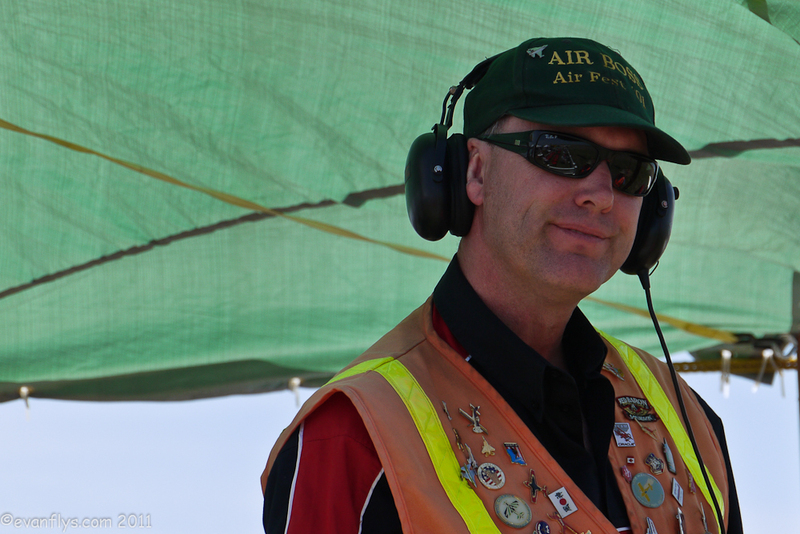 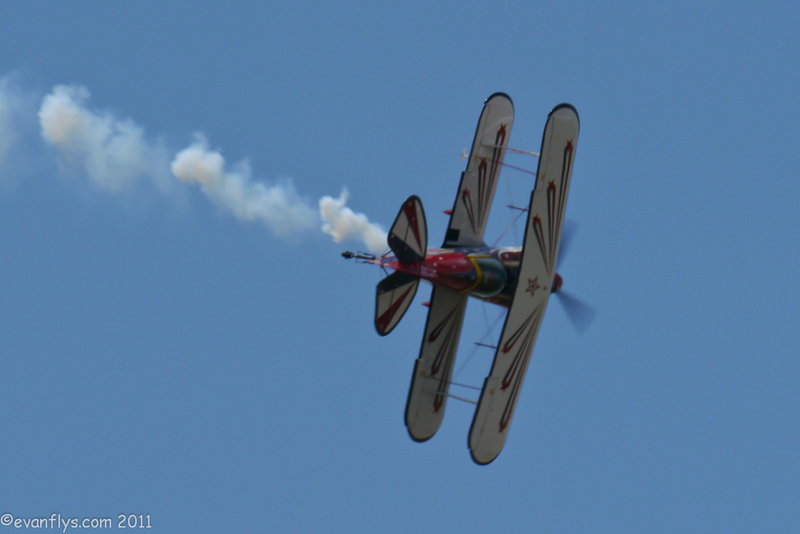 The Golden West Airshow and Fly-In is always a favorite of mine. 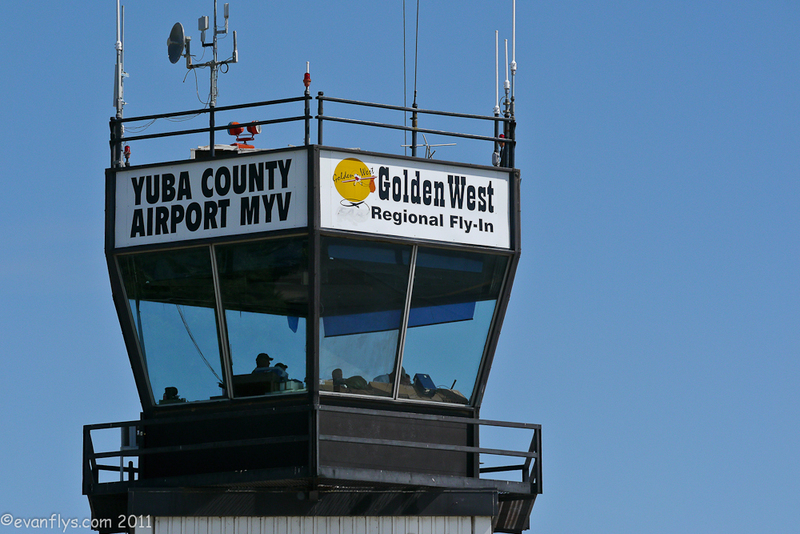 One of the things I like about it is that it has a nice small town feel to it. 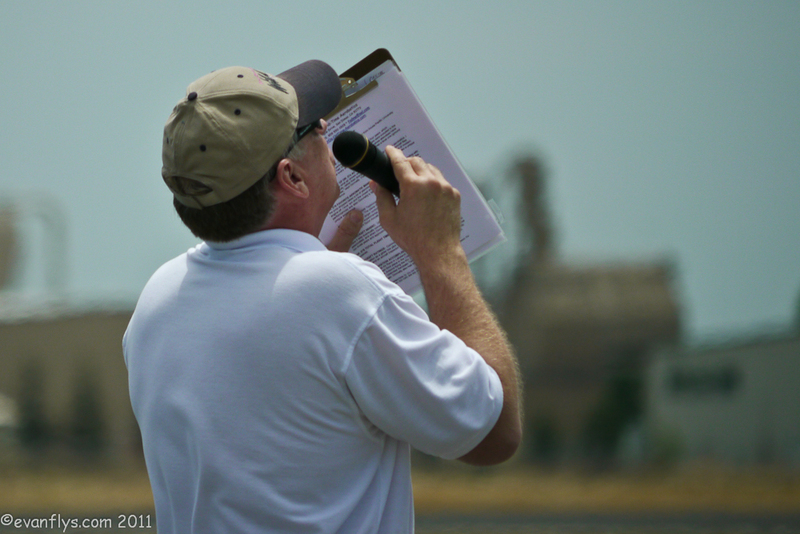 Having Willie Turner as the Air Boss always makes a smooth show and Steve "Wild Thing" Stavrakakis is the best announcer around! 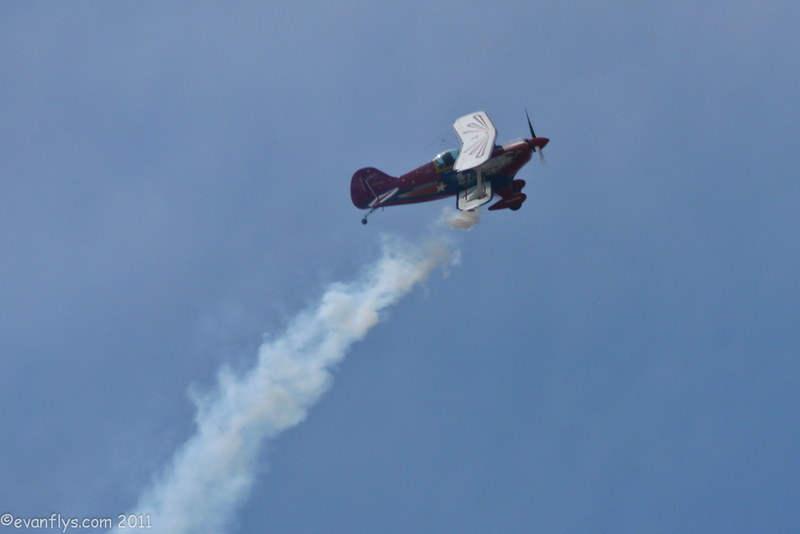 Lots of neat airplanes come to this show every year and this year there was a Beechcraft prototype Staggerwing AND the only open cockpit Stinson ever made! 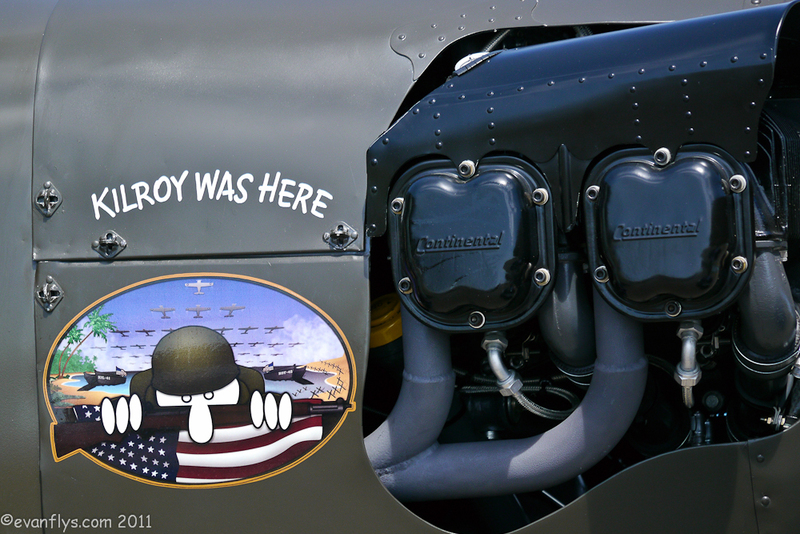 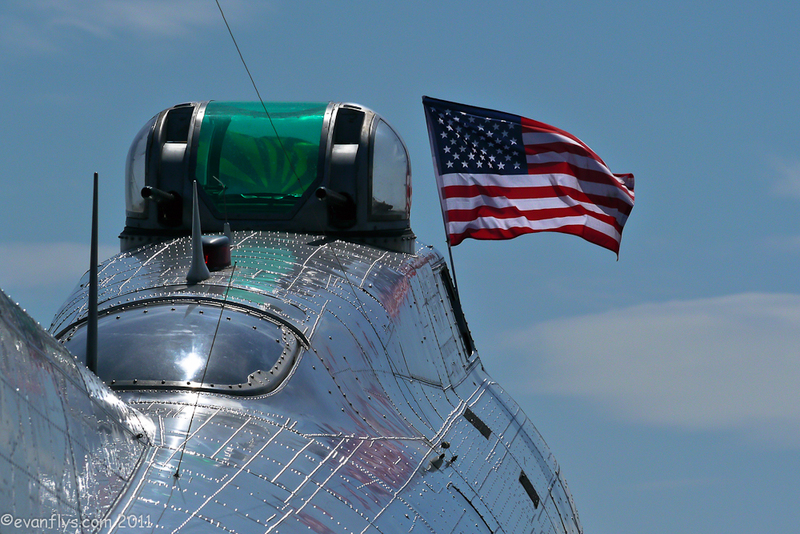 Plus, the Commemorative Air Force's B-17 and B-25 were there giving rides! 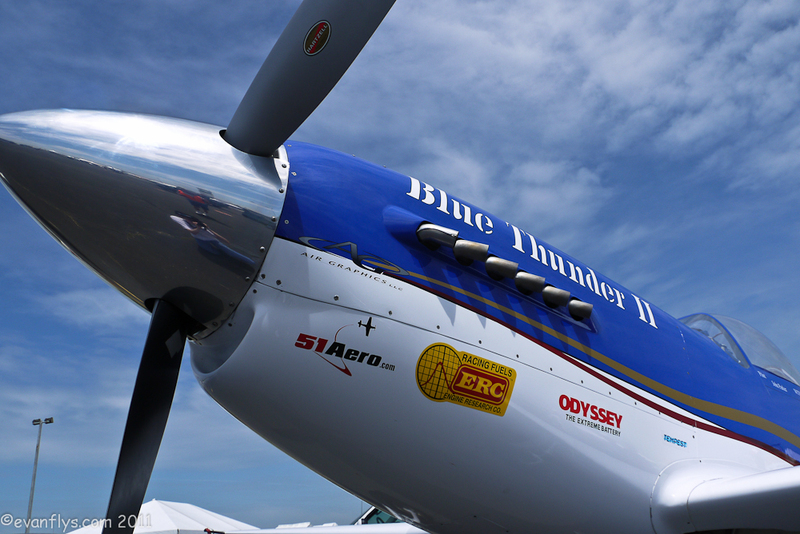 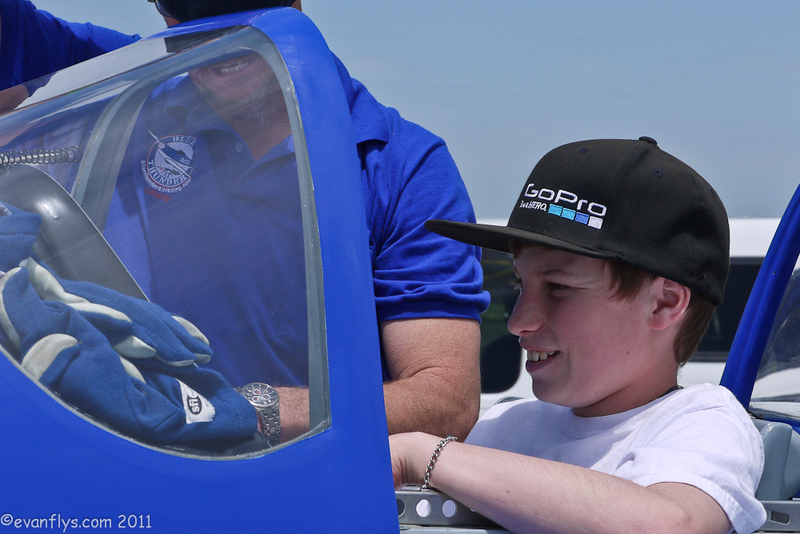 A highlight for us was getting to visit with John Parker, SteveO and Mike from the Blue Thunder air race team. 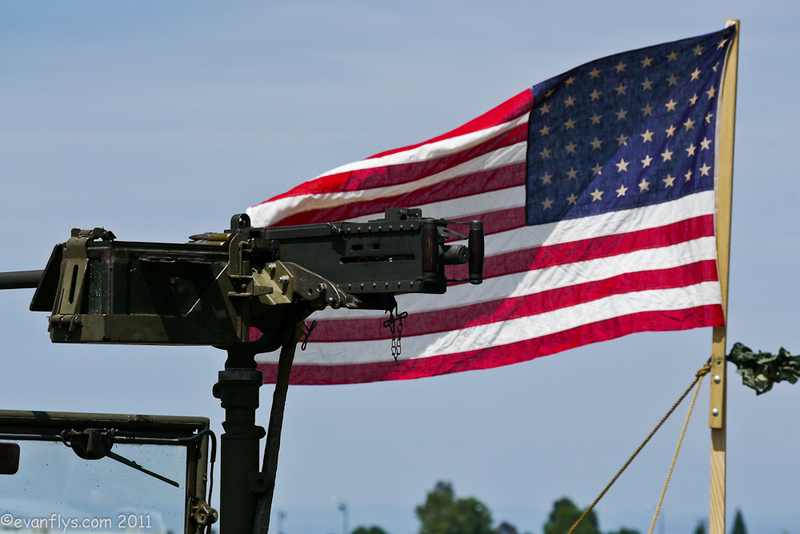 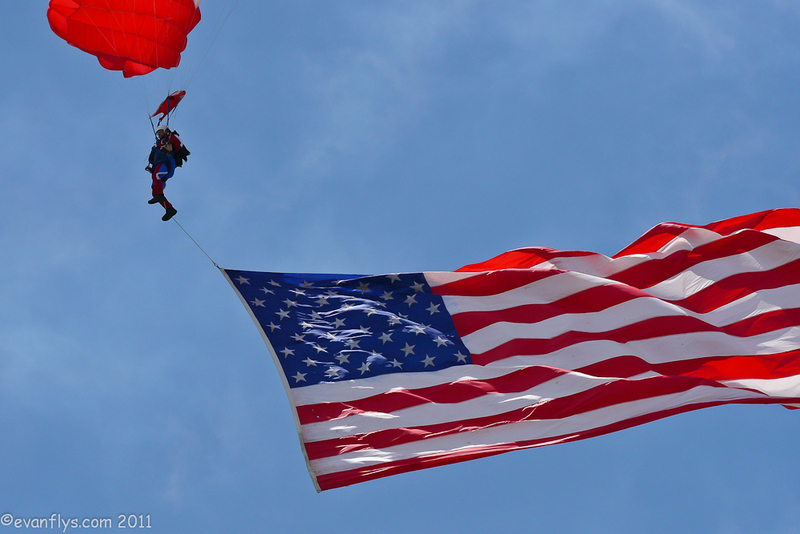 To start the airshow off, the Liberty Parachute Jumpers parachuted down with a huge American flag and Vicky Benzing was circling them. 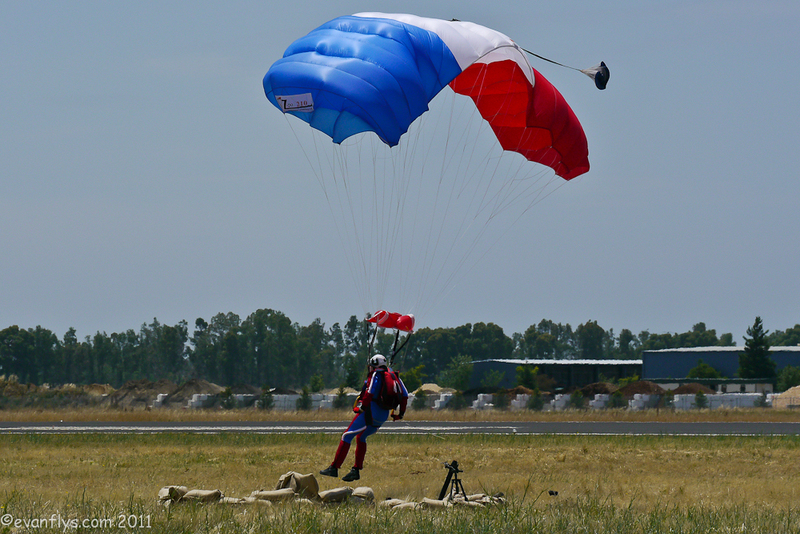 After the national anthem was finished and the jumpers landed, Vicky did an absolutely amazing job pushing herself and her Extra 300S to the limit. 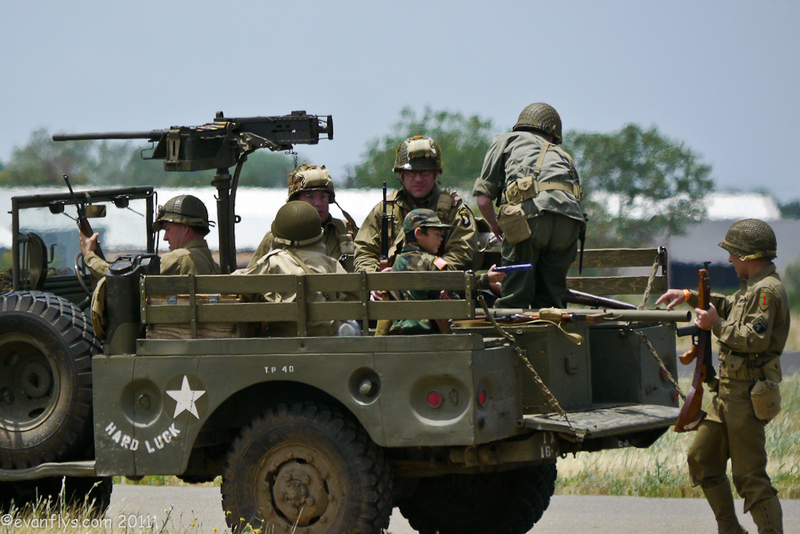 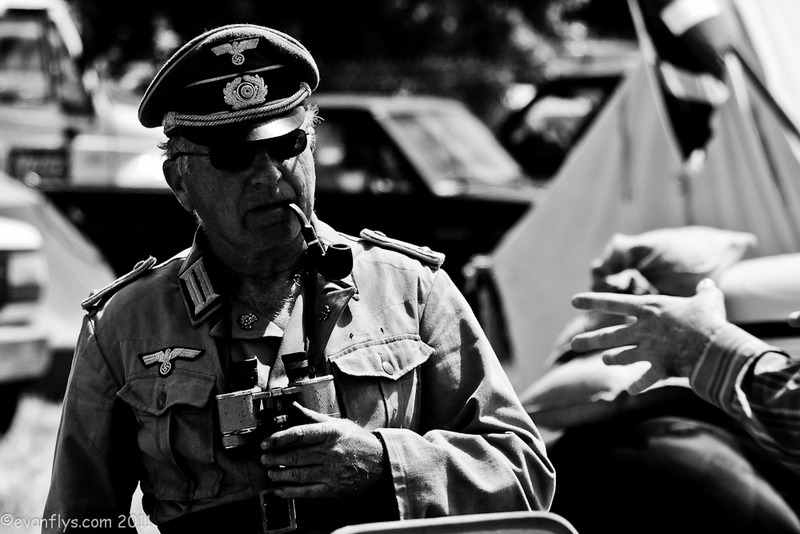 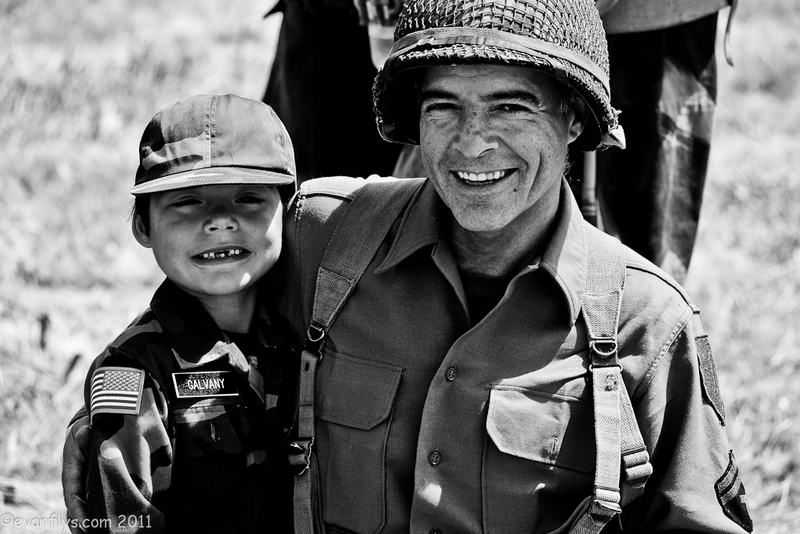 After her was the WWII re-enactors. 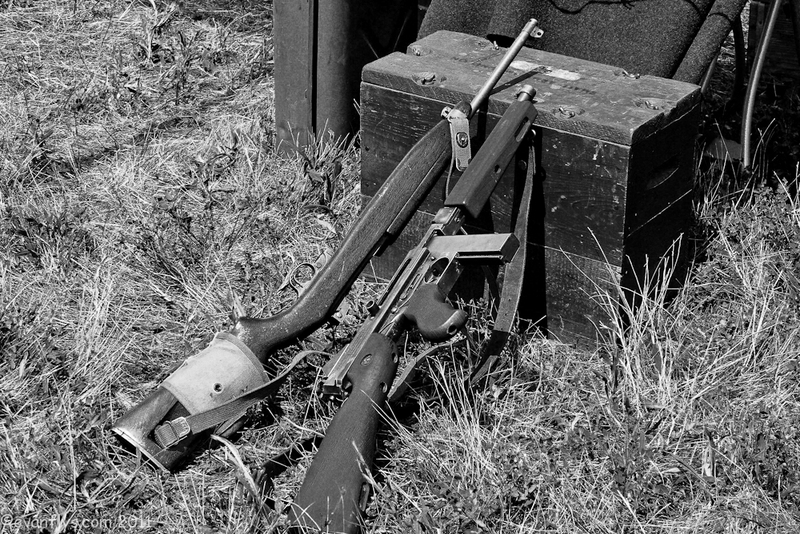 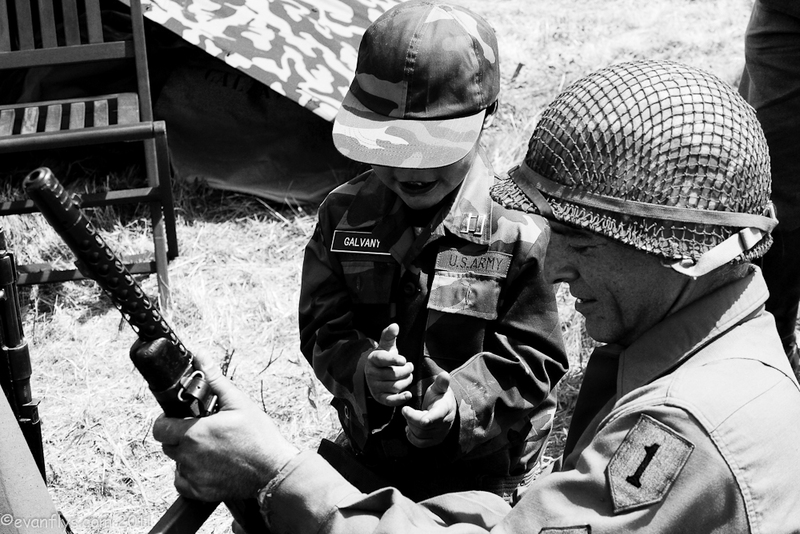 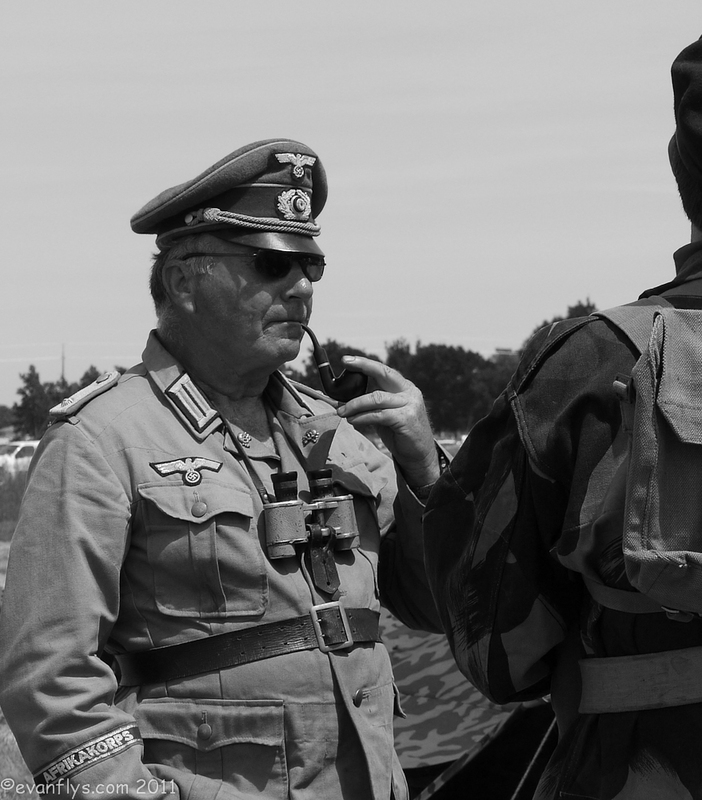 They were in highly accurate uniforms and had guns that fired blanks. 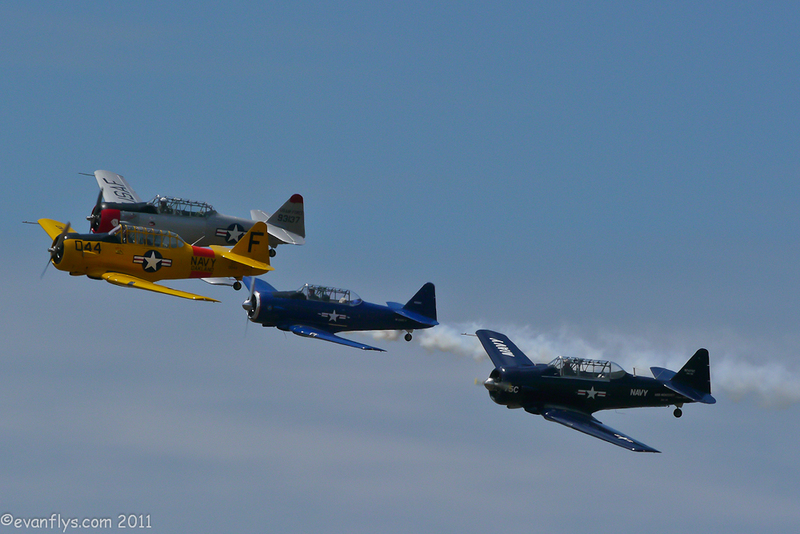 Four AT-6s took off and pretend-strafed them while the re-enactors were shooting at them with all their guns, including .30 and .50 caliber machine guns! 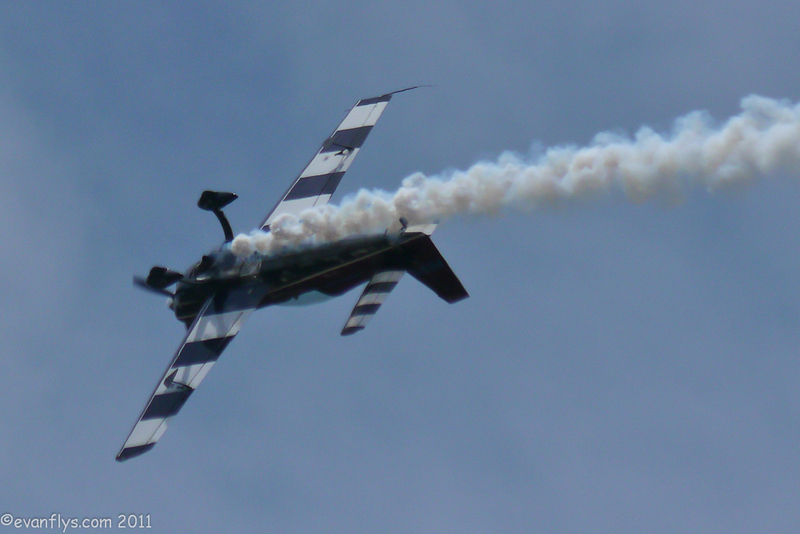 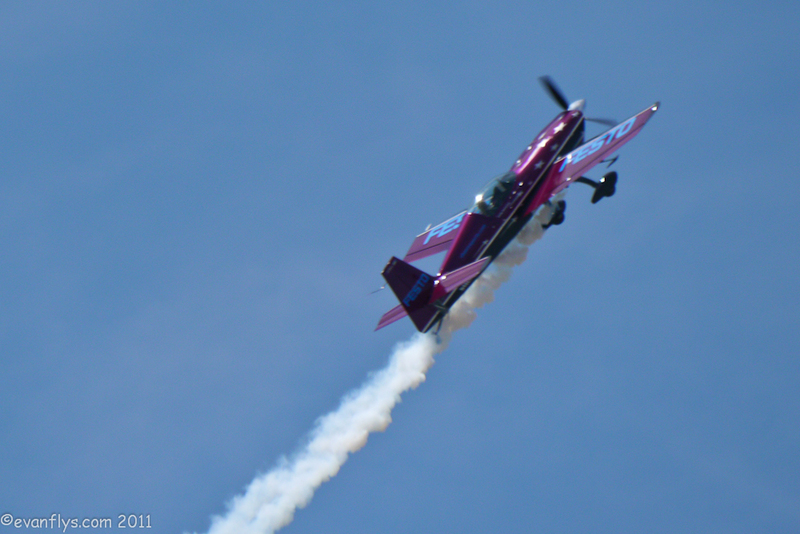 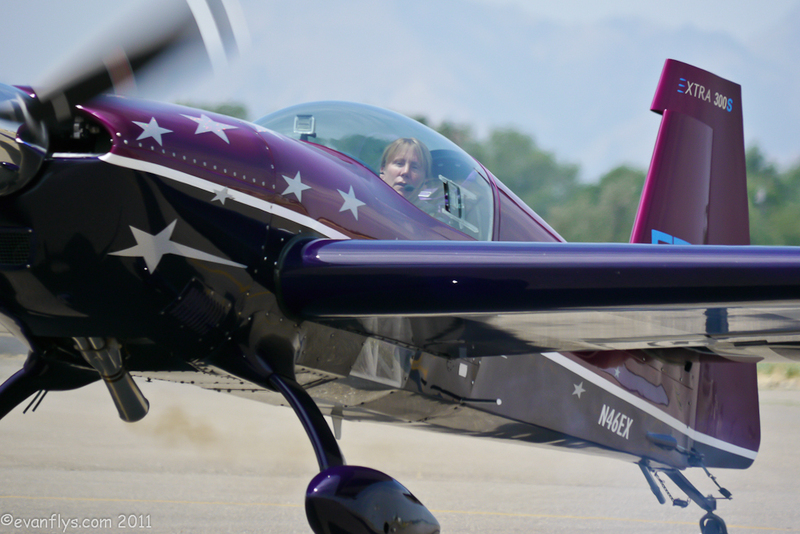 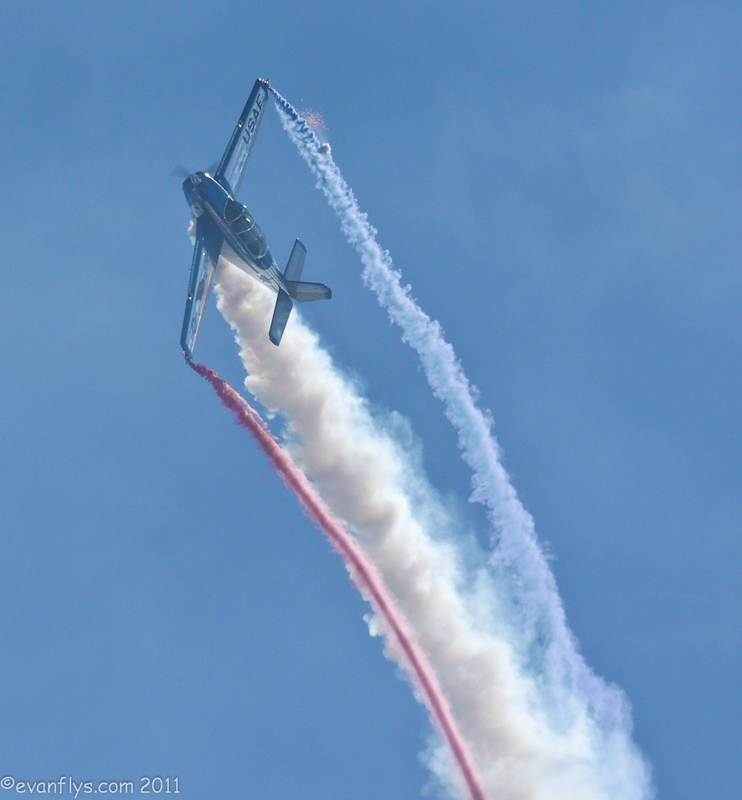 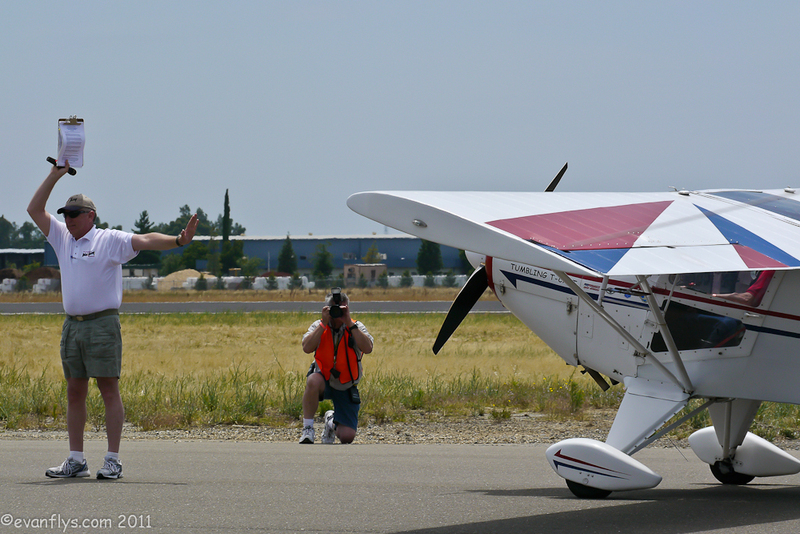 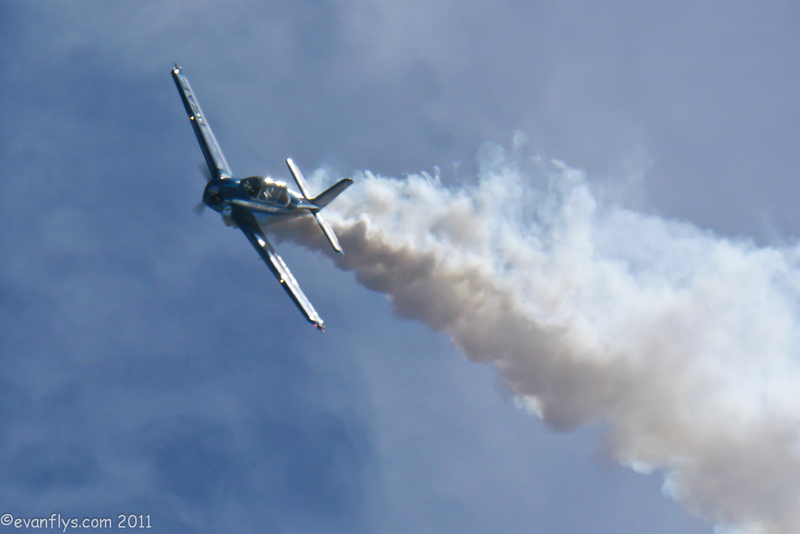 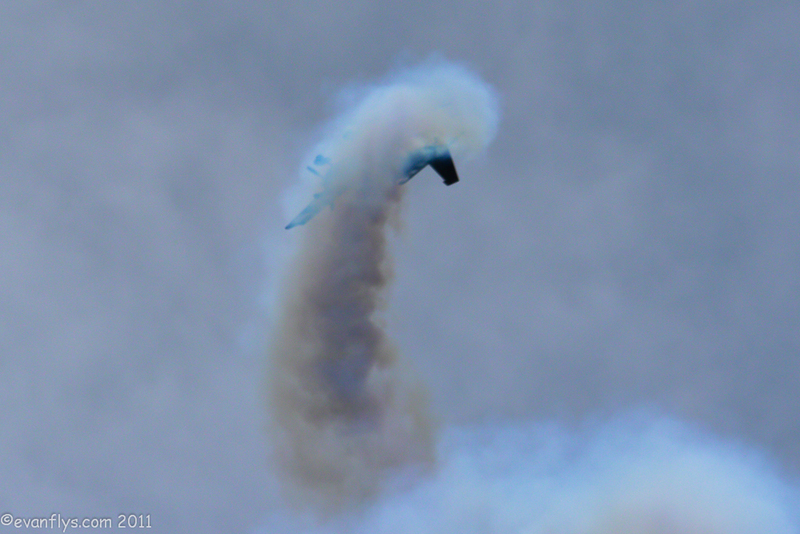 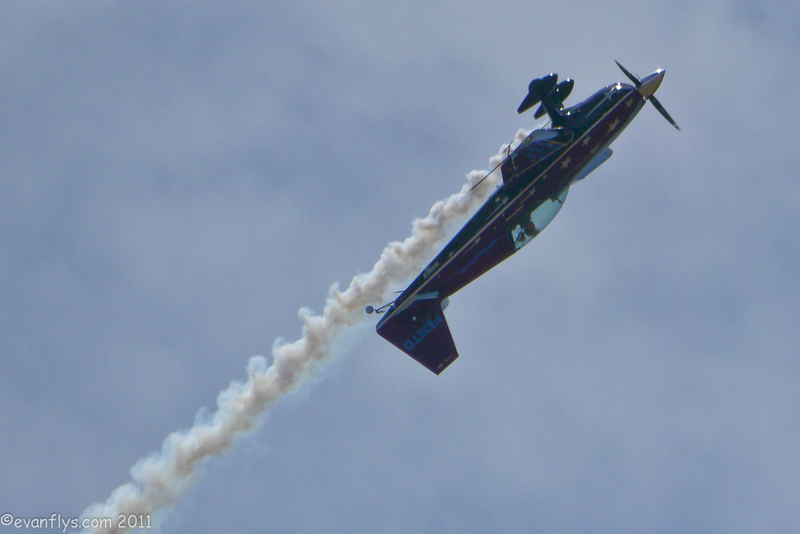 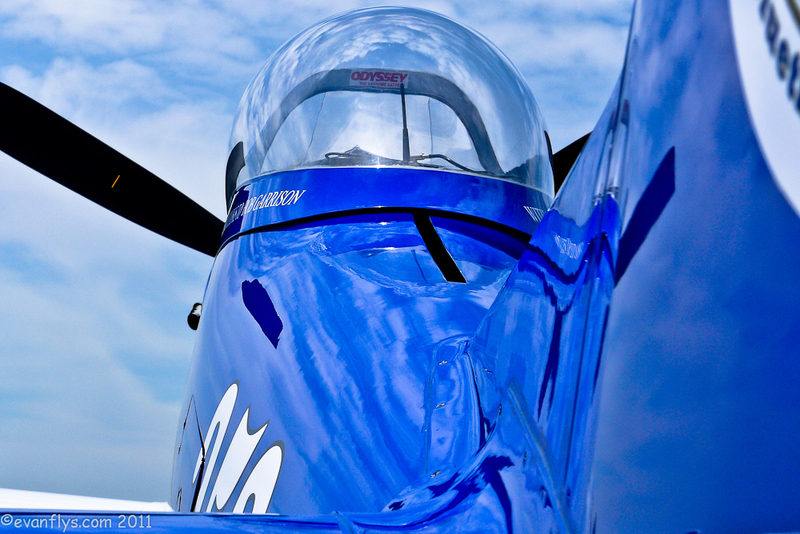 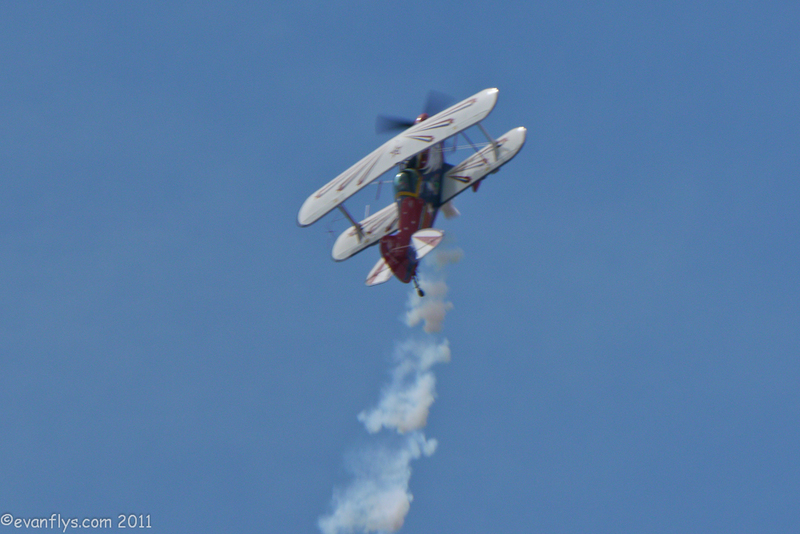 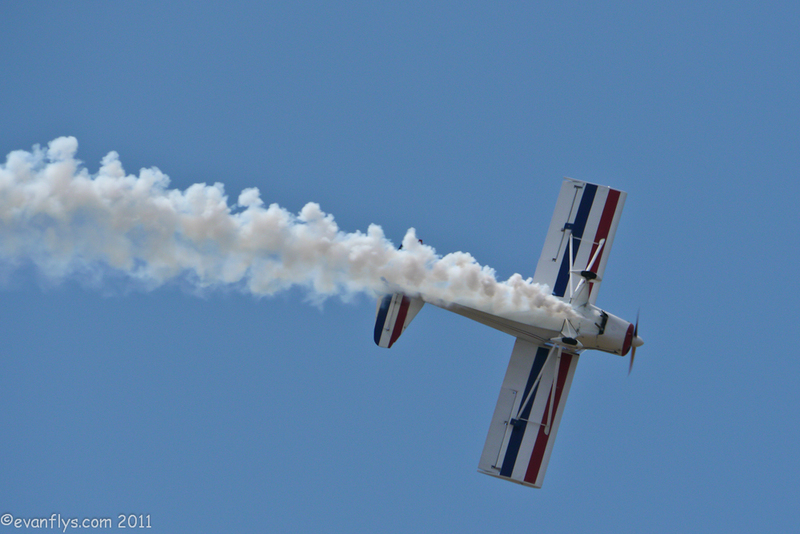 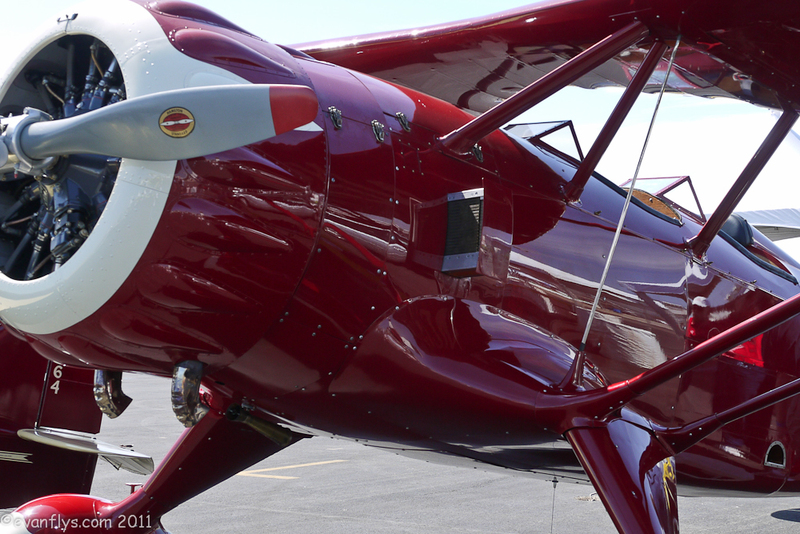 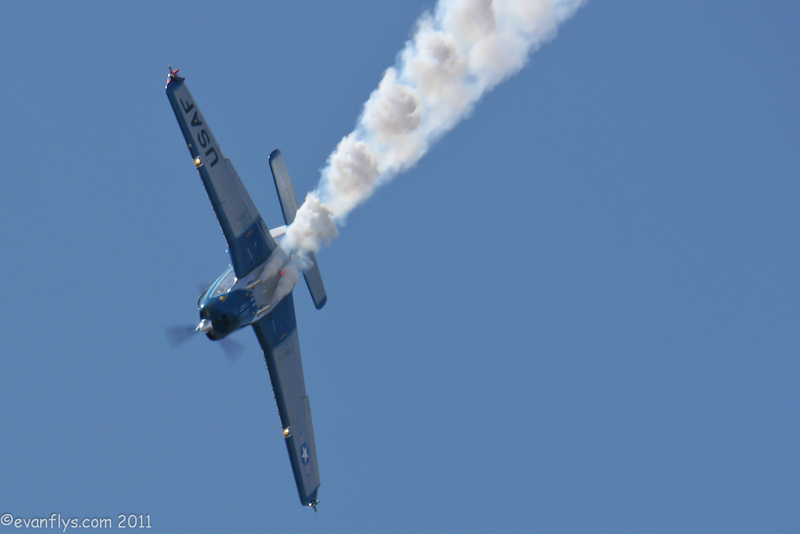 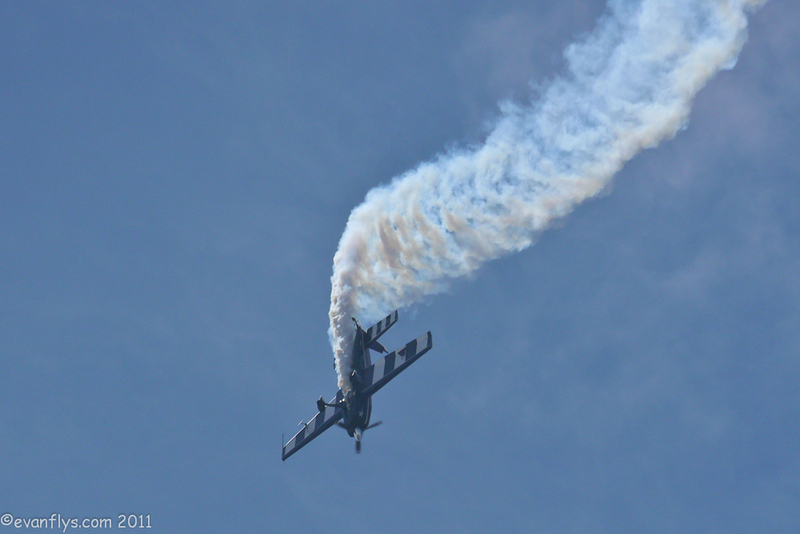 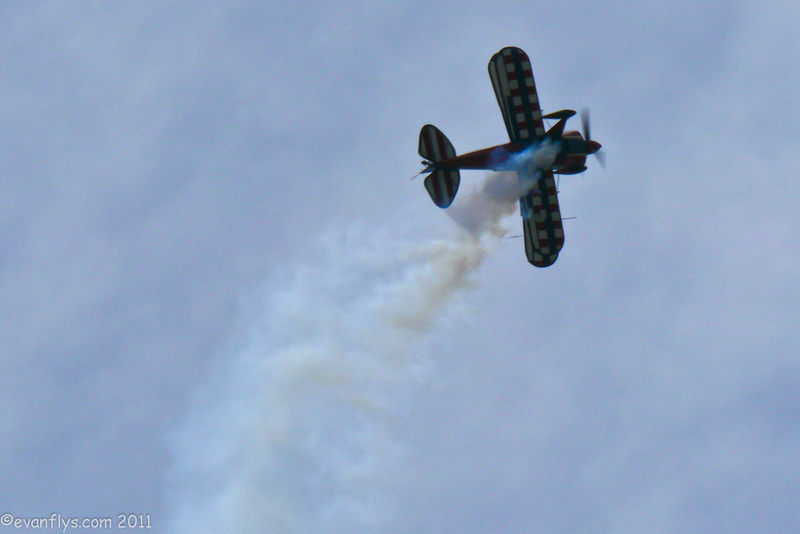 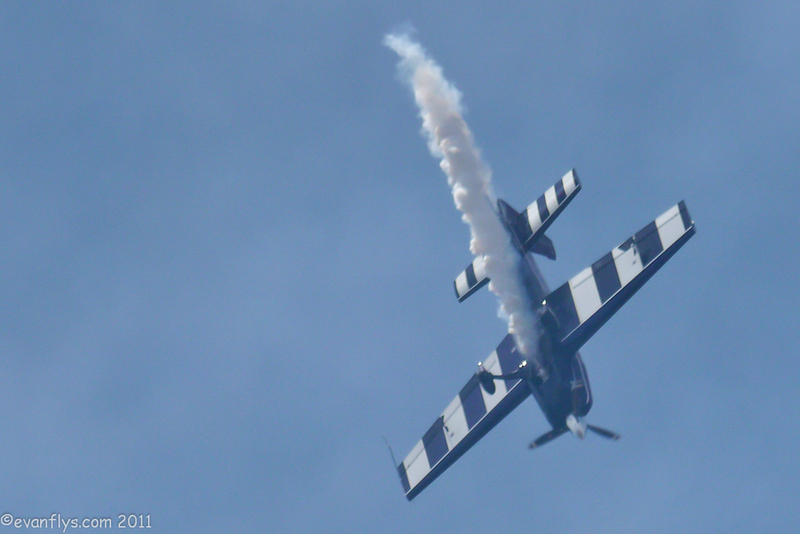 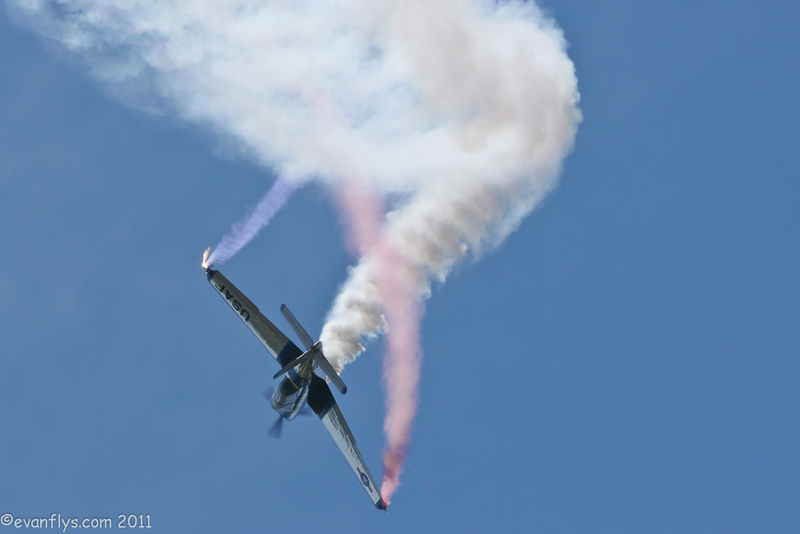 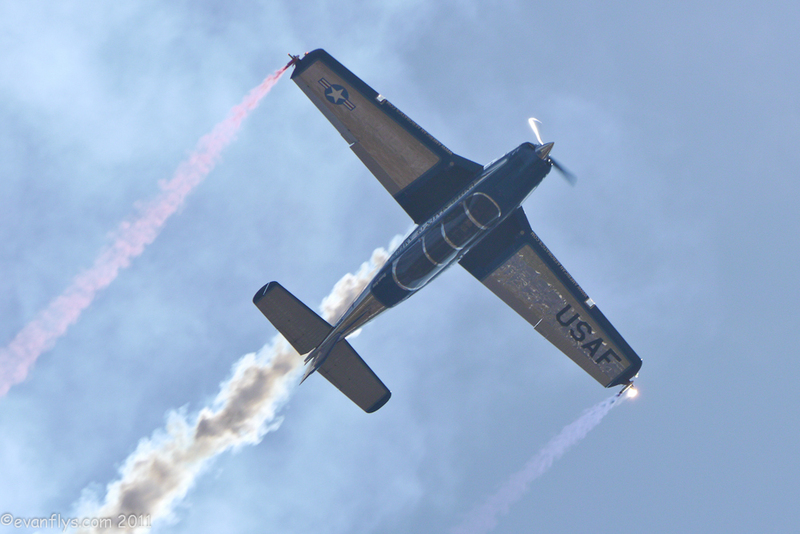 Next up was Jacquie Warda in her Pitts S1T, and she tore up the skies with her awe-inspiring routine. 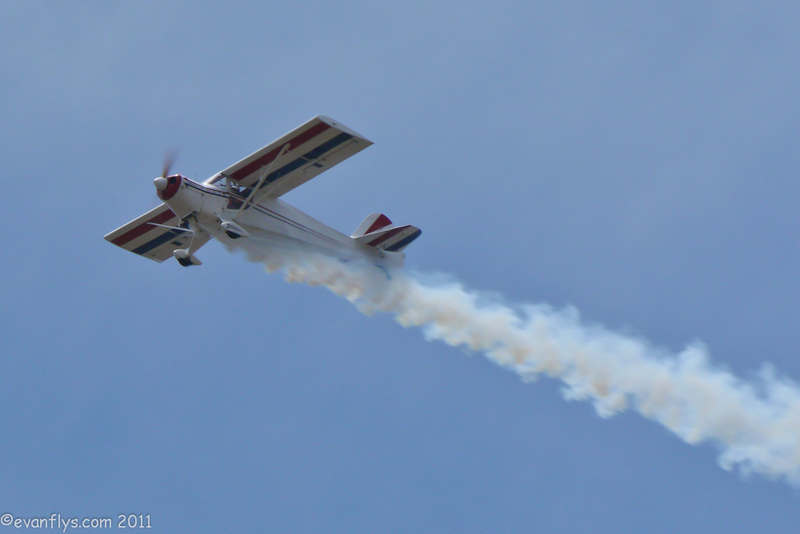 After her came Dr. D, aka Frank Donnelly, in his antique clipped-wing 1946 Taylorcraft. 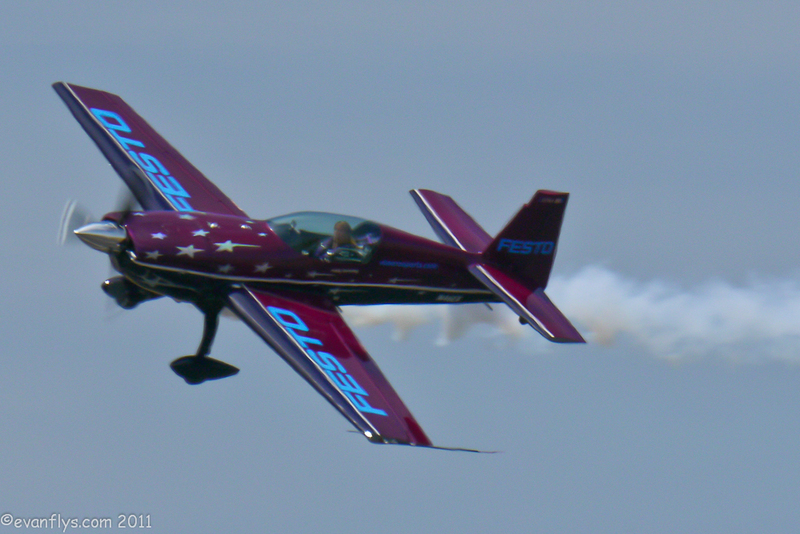 Dr. D always wows the crowd, tumbling all over the sky, and even shutting off his engine at 1500 feet, and came to a complete stop in the announcer, Steve Stavrakakis's hand! 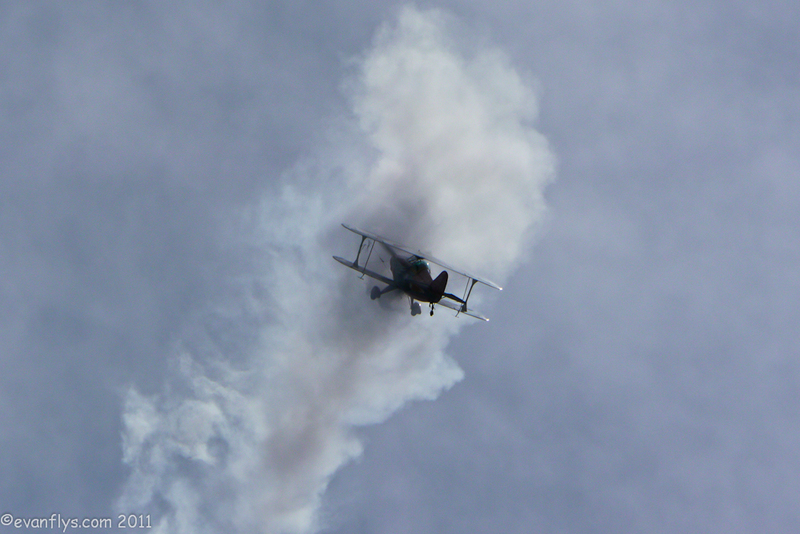 Without turning the engine on! 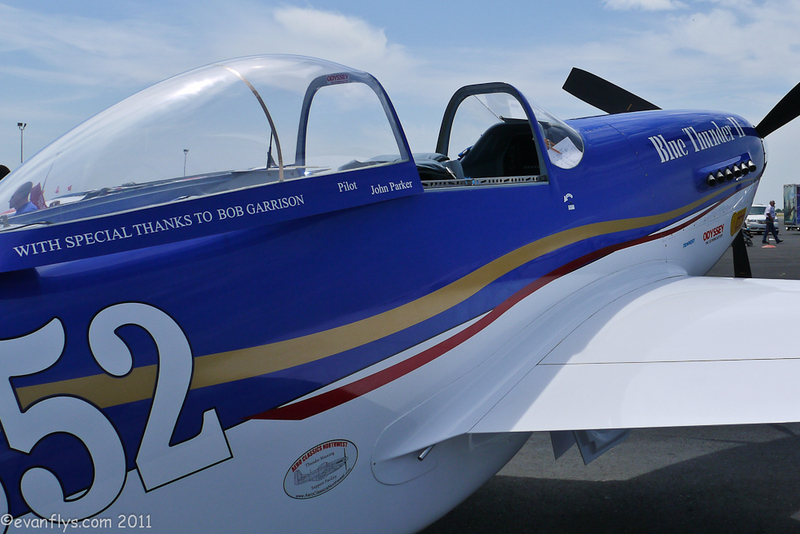 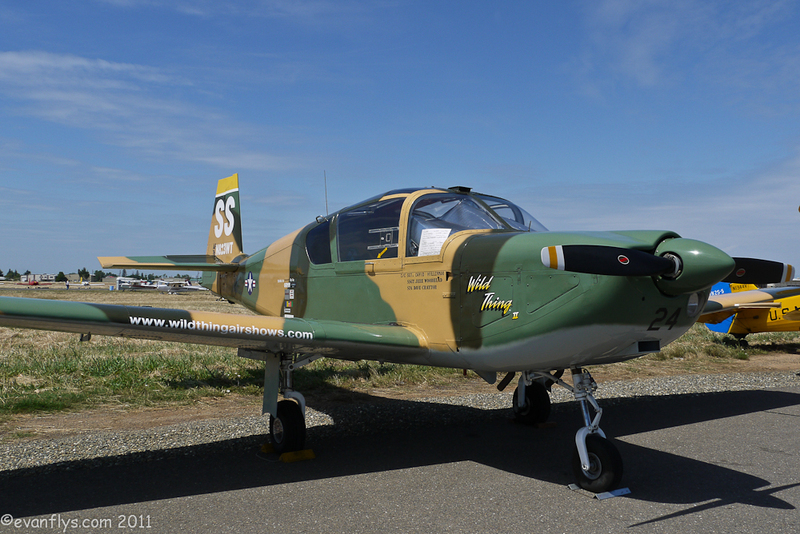 Lastly, Julie Clark did a fantastic job in her Beech T-34 Mentor. 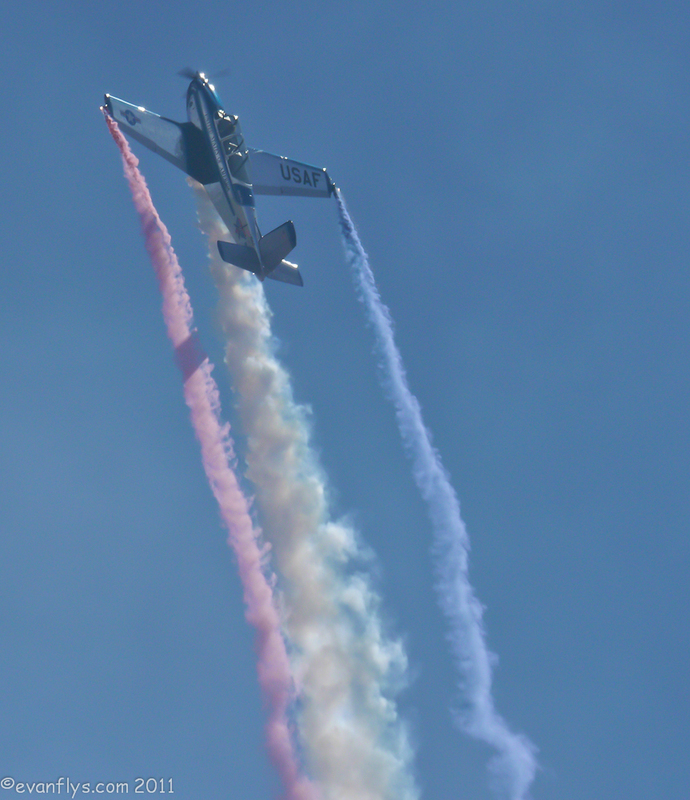 As far as I know, she's the only performer with multicolored smoke, and the most patriotic pilot there. 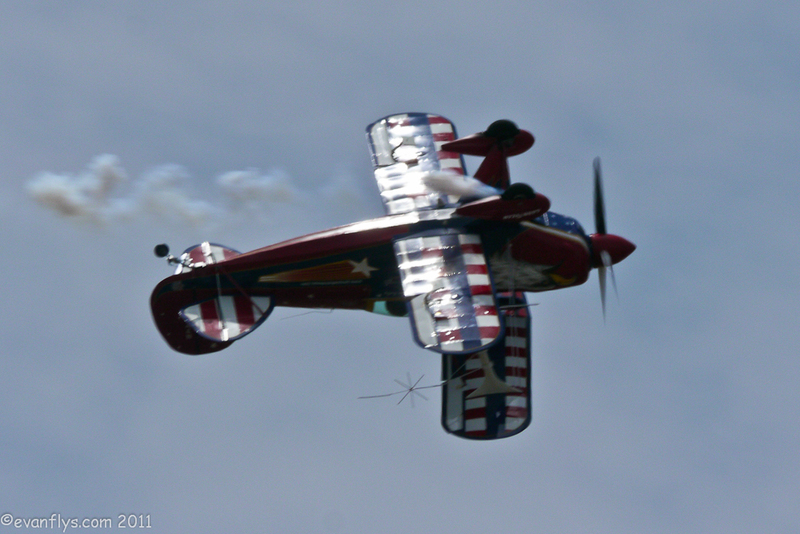 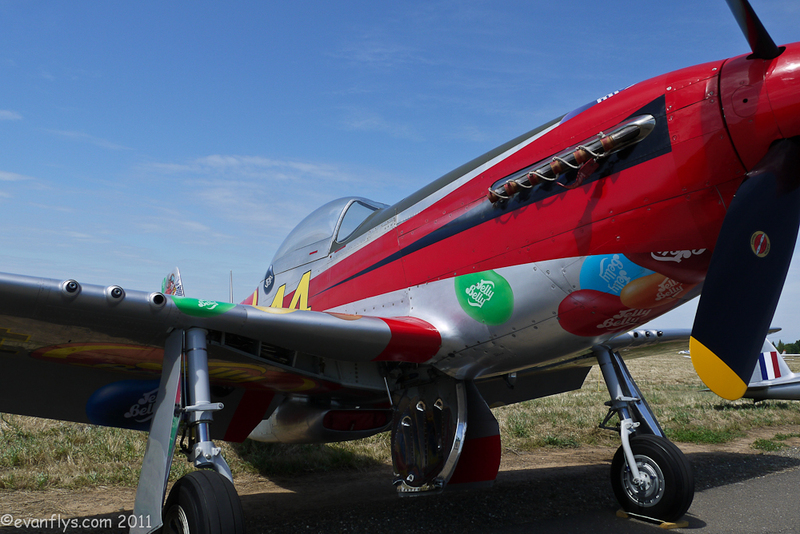 For a plane that isn't meant for aerobatics, she sure does a great job! 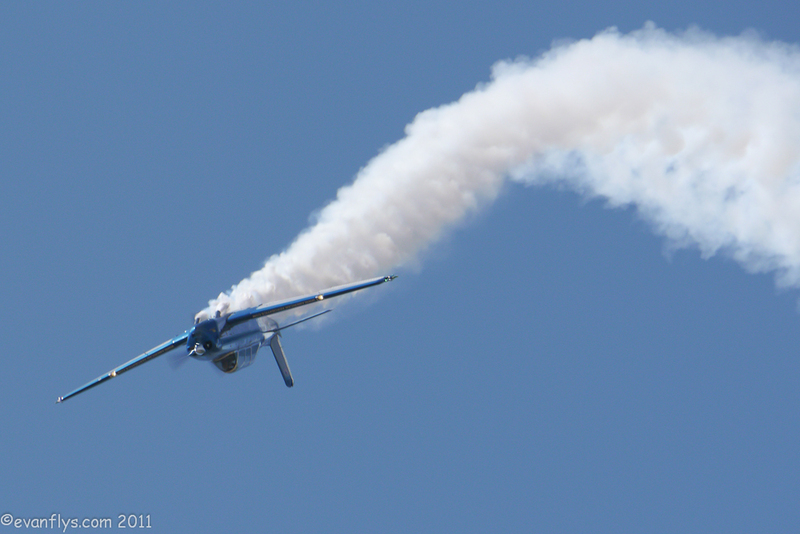 Unfortunately, the F/A-18 could not go up, but show still was a blast. 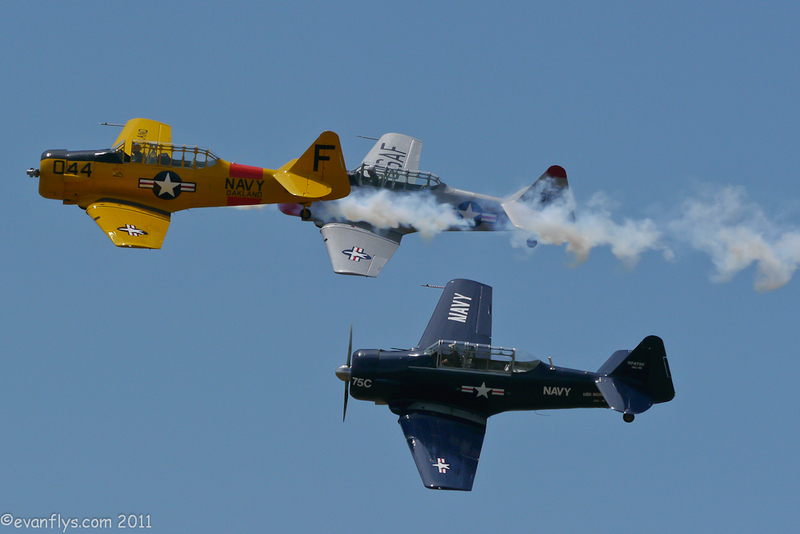 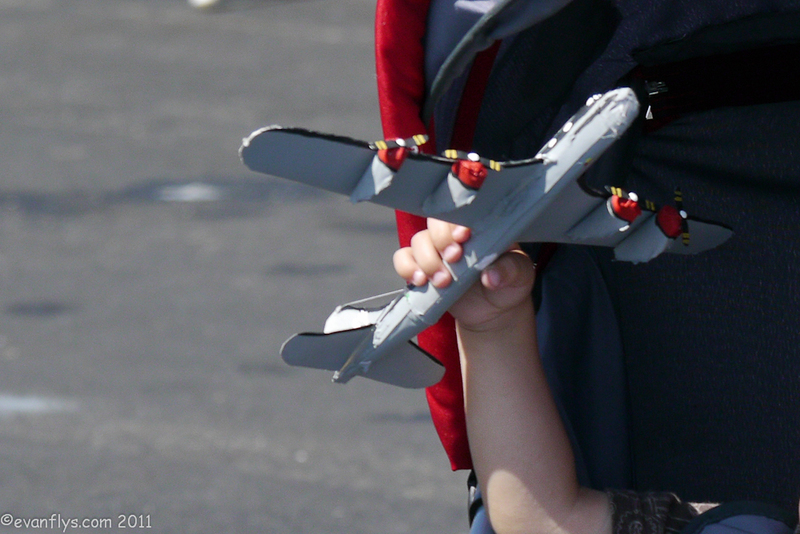 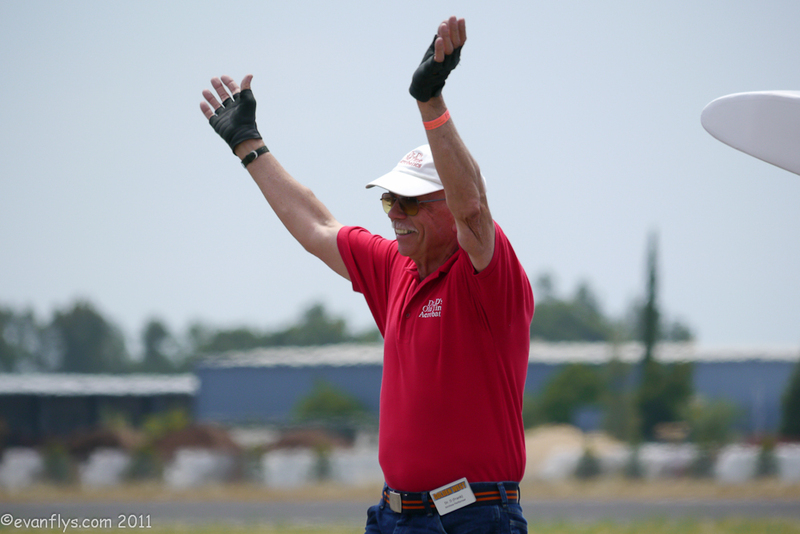 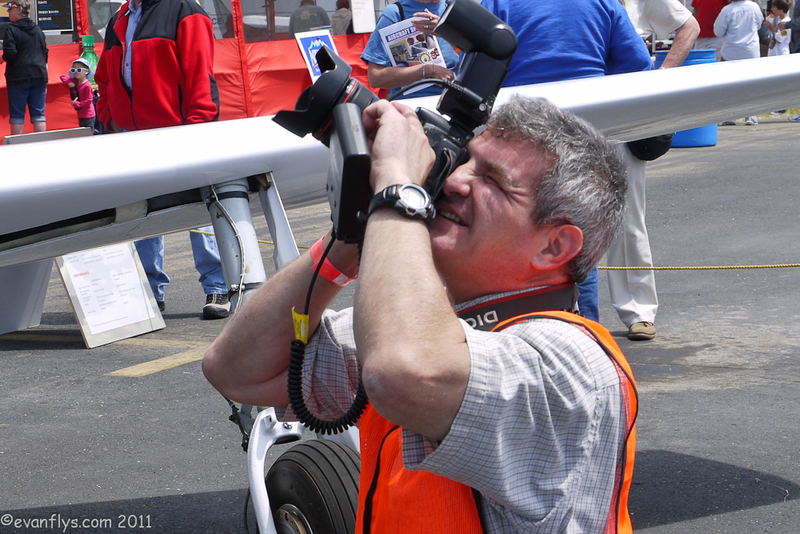 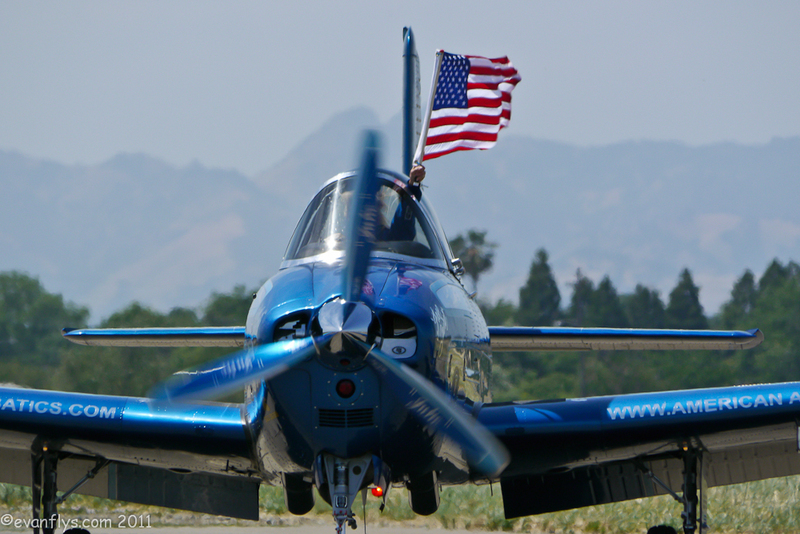 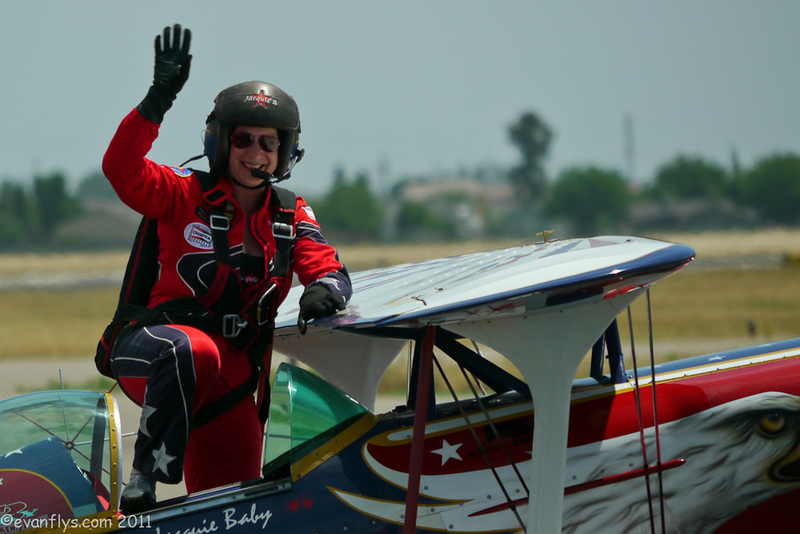 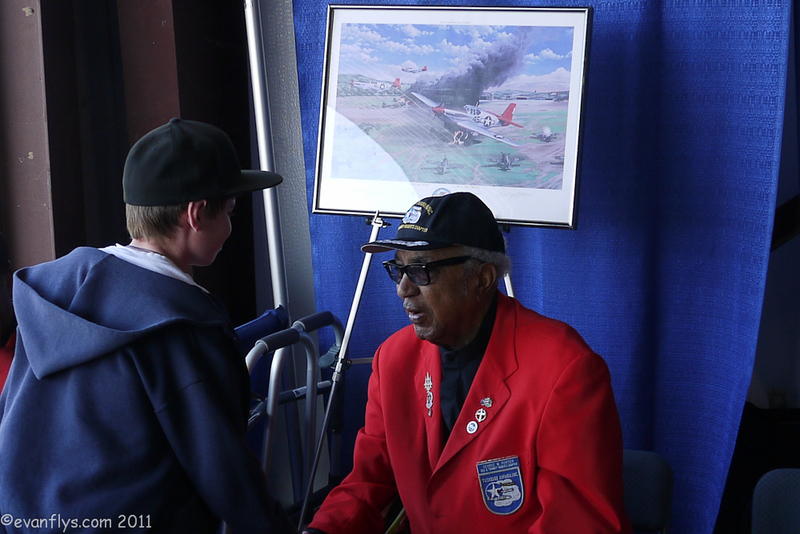 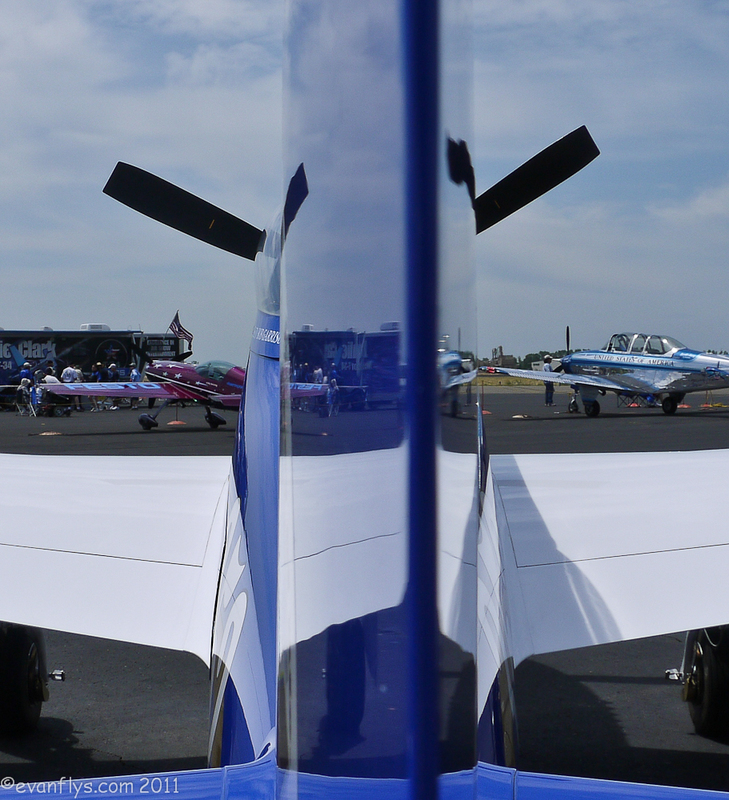 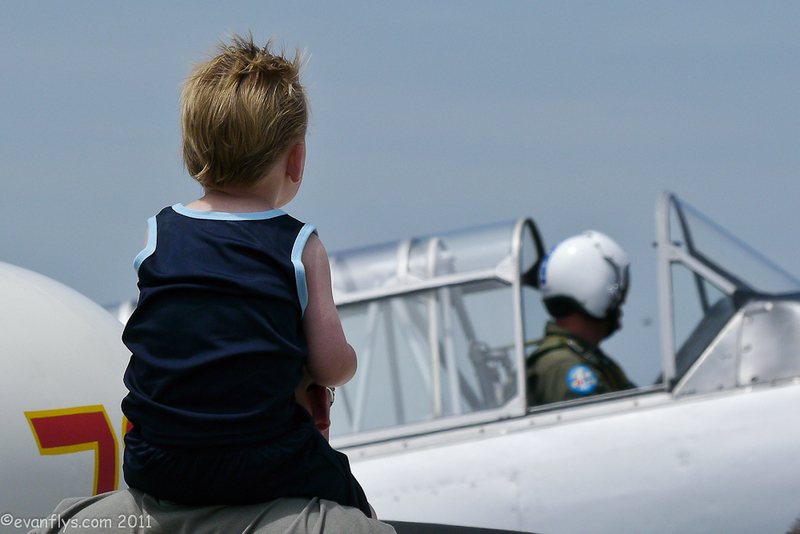 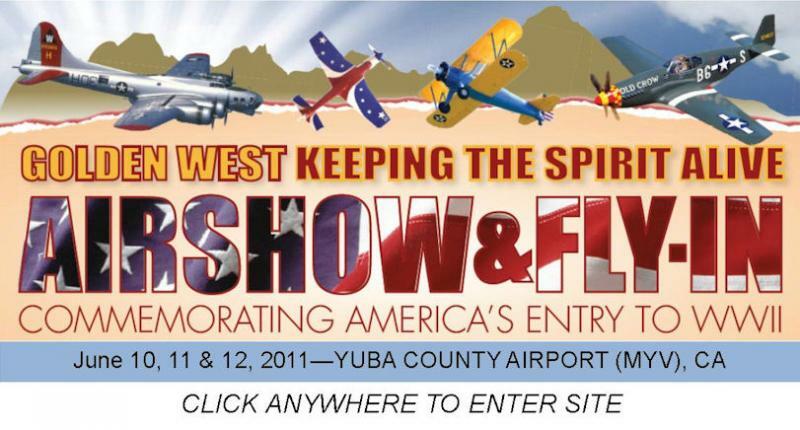 With lots of my friends there and even more cool planes and cars, I hope to see you next year at the 2012 Golden West Airshow and Fly-In!